A “bomb cyclone” that struck the Midwest in mid-March caused major flooding across Nebraska and parts of Iowa and Missouri, damaging highways, roads and bridges and causing in excess of $1 billion in property losses, according to news reports. 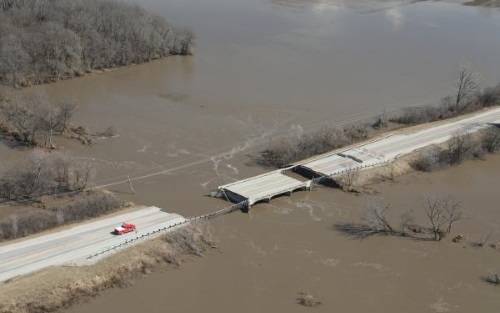 The Nebraska Department of Transportation reported that more than 1,500 miles of roads were closed at the height of the flooding on March 18, with 15 major highway bridges completely washed out or severely damaged as a result of the high waters. The Nebraska Emergency Management Agency reported that as of March 20 more than 80 percent of the state was under emergency declaration orders, including 77 counties, four tribal nations, and five special government areas such as unincorporated townships. The flooding, caused by heavy rains occurring simultaneously with melting snow, was exacerbated by chunks of ice swept along by the waters that damaged buildings and infrastructure, the NEMA noted. Nebraska National Guard helicopter crews resorted to dropping hay to cattle stranded by the high waters to ensure they didn’t starve. The Midwest flooding also triggered an emergency declaration by the Federal Railroad Administration on March 19. The Iowa Department of Transportation closed sections of Interstate 29 and established detours on March 15 in cooperation with the Missouri Department of Transportation and other public agencies due to the flooding, placing restrictions on parts of Interstate 680 as well due to damage from flood waters. Several state DOTs have been dealing with the impact of winter-related flooding and landslides this year. On March 20, Gov. Mike DeWine (R) declared a state of emergency in 37 Ohio counties that suffered serious highway damage following severe weather that began back in February. The emergency proclamation will allow the Ohio Department of Transportation and local governments to access federal emergency relief funds. For example, the Federal Highway Administration provided $10 million Emergency Repair or ER funding to the Tennessee DOT on March 15 to cope with roadway damage caused by “historical rainfall” in 72 counties this February. The Ohio DOT received $4.5 million in ER money from the agency on the same day to help repair State Route 376 after a landslide caused by heavy rains forced it to close in late February.